I have claimed a project" capital as a power", howerer, I didn’t find “translate using Kató TM”, inatead I found " submitted complete task", which i think it’s not the one I should click to start translating. So please help with this issue. Hello. Thank you for your message. 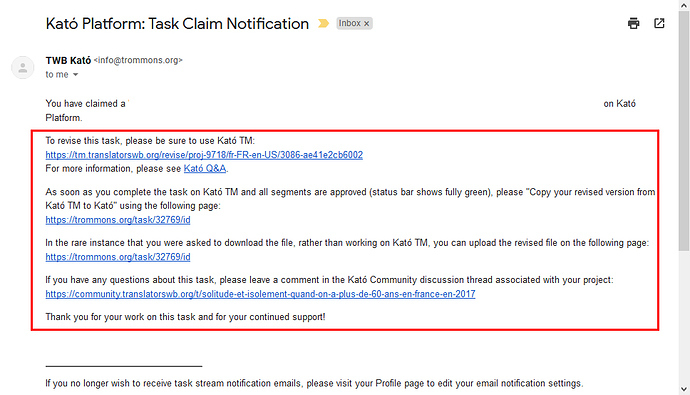 According to this photo, when you claim a task, you will receive a Task Claim Notification e-mail. Then, you can follow the TM link and use it. Hi @SUSAN3, it seems that you’ve unclaimed this task, is that right? It also looks like the Kató TM is available for this project. Let me know if you still have questions about this task!